Amazing stuff is happening in France. It all began with a relatively well-known French-Cameroonian comedian, Dieudonné M'bala M'bala was invited to participate on a TV show on the channel France 3. The show also featured a Maghrebian artist and Dieudonne decided to impersonate an extremist Israeli settled infuriated by the presence of an Arab on a French show (for those of you who understand French, you can see an excerpt of his appearance that day here). Dieudonne who, in the past, had always enjoyed ridiculing pretty much every segment of French society clearly had never expected the hysterical uproar that his humor would trigger that day: the huge constellation of French Zionists organizations lead by the notorious CRIF ("Representative Committee of Jewish organization in France" - the French version of AIPAC) immediately attacked Dieudonne, suing him for racists comments and suing him for "anti-Semitism" (a criminal offense in France). This was hardly the first time that the French Zionist mob had decided to crush an outspoken critic of its role in French politics or its unconditional support for the last racist state on the planet: Israel. But this time, the Ziomob miscalculated, badly. This was not at all what the Ziomobsters in France had hoped to achieve when they attacked Dieudonne for his appearance on France 3. In response to his defiant stance, they then used their total control over the French political class to shut down his shows under the pretext that they would "threaten the public order". Dieudonne immediately replied that France is capable of providing the security needed for an event like the G8 summit, but not to let one comedian make his show. Still, while in the past he had filled the biggest concert halls in France, Dieudonne was forced to perform his skits in a rented bus (you can see a report about this here). But Dieudo, has he is known, had one more thing up his sleeve. His logic was simple: if I cannot use my freedom of speech as a comedian, why not use it as a politician? Needless to say, the French political elites had a total hysterical breakdown at such inpudence. Doubleplusgoodthinking reporters and commentators declared that his political party had to be banned and that Dieudonne was probably mentally insane (the latter reminds me of the old trick invented by Yuri Andropov's KGB who used to declared that Soviet dissidents were "obviously" insane because how could any mentally sane person oppose the Soviet rule: QED). What is most interesting in this list is that its candidates come from every political movement imaginable. Unionists, nationalist conservatives, Roman-Catholics, Muslims, ex-Communists, Socialists, etc. Ethnically, everybody is also present. It appears that the Zionist threat is truly uniting many of those who until recently were virulently opposed to each other. What is the potential of this political movement? On one hand, the entire weight of the French political establishment is now coming crashing down on Dieudonne. Every politician, every newspaper, every commentator either completely ignores Dieudonne and his movement or, when they speak of him at all, it is with a vitriolic loathing which cannot be imagined. The French newspaper even calls him a "comedian" in quotation marks, showing that such a hideous figure as Dieudonne cannot be called a comedian or somebody who makes people laugh. The fury of the establishment is such that I find it very likely that Dieudonne's political movement will be simply banned and declared a criminal organization (in France, the membership in an organization declared illegal is considered a crime in itself). If not, Dieudonne might do very, very well. The fact is that there are literally millions of French citizens from all parts of the society who are sick and tired of being ruled by a small group of mutually interchangeable elite (all of which is 100% loyal to anything Zionist or Israeli). The fact is that in the French "banlieue" (suburbs) there are hundred of thousands of Muslims who are outraged by the events in Gaza, the war in Iraq, the war in Afghanistan and the constant threats against Iran. The fact is that the economic crisis had hit France - and the rest of the Eurozone - very badly and that more and more people are making the link between the Israeli-American model of globalization and the economic collapse of the world markets. In fact, I would say tha the potential of Dieudonne's movement is huge and that it represents a very real threat to the French and, beyond that, USraelien elites in the West. The fact that Dieudonne himself is (half) Black, and that he succeeded in federating very different currents of the French society under his stance will make it impossible to simply ignore him. 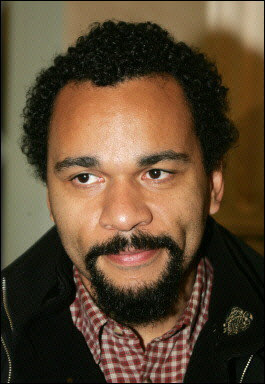 Can the French political establishment engage Dieudonne and prevail over him in an open political debate? Not in a million years. Banning Dieudonne's political party will, at best, be a stop-gap solution as we can be certain that Dieudo will sue the French courts in Brussels and that, if needed, he will simply re-compose his movement under another name. Under the infulence of the recent immigrants to France, the French society is changing and it appears that while the "native" French did not have the wits and guts to take on the Ziomob in power, those who immigrated to France do have what it takes. It is amazing to listen to these recent immigrants defending the secular and multi-ethnics nature of the French Republic and denoucing the ethnic and tribal nature of Jewish ortanizations in France. For example, Dieudo was once asked what he thought of the attemps made by such French Blacks to create an organization which woud speak for them. Dieudo rejected this approach, saying that the organization which should speak for them should be the French Parliament. Amazing idea, no? Thanks to Dieudonne, Zionism is now finally being denounced as a tribal and racist, ideology and suport for Israel is now becoming as morally repugnant as support for Apartheid. The entire intellectual edifice which was carefully built by the Zionists in France for many decades is not coming crashing down because once these issues are out in the open, the Ziomob has already lost the key battle. In fact, Dieudo has said that he has already won the next election. What will happen next? Dieudonne does not take his participation in the upcoming elections too seriously. As a typical comedian, he can sit there and say "I will bring you all to the light" with a serious face. When asked if he is really serious, her replies that nobody in French politics is serious and that the difference between him the the rest of the French politicians is that they are lousy comedians whereas he is a professional. Humor as a weapon of liberation can be very powerful. The ridicule which Dieudonne is now heaping on the previously sacred cows of French Ziopropagnda, such as the "The Eternal Memory of the Shoah" (all in caps), and all the rest of the Zionist brainwashing toolkit might well prove to be a formidable weapon for which the Ziomob does not have a standard answer. It will be very interesting to see what happens between now and June 7th - the next election. In the meantime, here are some links to Dieudonne's non-political skits. Enjoy!